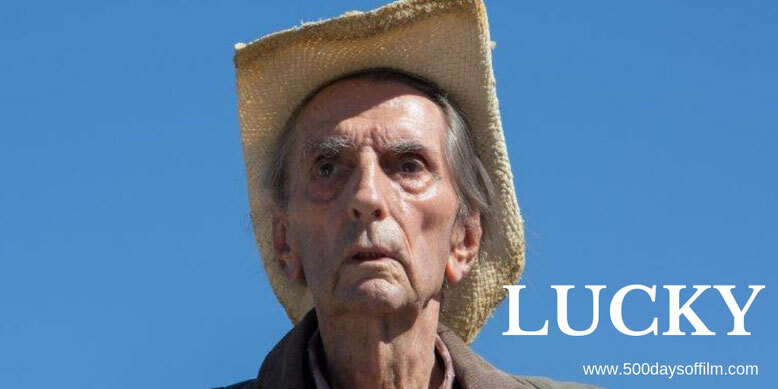 Having outlived and out smoked all of his contemporaries, the fiercely independent Lucky (Harry Dean Stanton) finds himself at the precipice of life, thrust into a journey of self exploration, leading towards that which is so often unattainable: enlightenment. Honouring an actor like Harry Dean Stanton in a film starring Harry Dean Stanton would surely have felt daunting for even the most experienced of film directors. Not so John Carroll Lynch who, in his poignant debut feature, celebrates Stanton in what, sadly, would be his final performance. Stanton is utterly superb in Lucky - a charming, funny and moving film that uses the experiences of its titular character to explore issues of loneliness and human connection, life and mortality. An example of this can be seen in Lucky's first line in the film. He walks into Joe's Diner and says to Joe (warmly played by Barry Shabaka Henley) "You're nothing". Joe then replies "You're nothing” to which Lucky says "Thank you”. This exchange was captured (by writer Logan Sparks) from the banter that Stanton used to have with a valet at Ago's in Los Angeles. “We all felt an immense responsibility to create from Harry's life, and from Harry's interactions, a story about a man who suddenly brings into his heart that he might have weeks and months to live, not years and decades,” Lynch explains. Stanton is ably supported by an impressive cast. While Beth Grant is brilliant as tough bar owner, Elaine, the standout performance for me came from one David Lynch. The legendary director plays Lucky’s friend, Howard, a man struggling with the loss of his tortoise. Nonetheless, making Lucky was a challenge for the new director. The film was shot in 18 days on a limited budget. However, according to Lynch, his primary concern was Stanton’s energy. Speaking before the actor’s death, Lynch explained that, prior to shooting Lucky, he had also played the lead in film with an 18-day shoot: “I was in every scene, and I was exhausted - and I am just a little more than half of Harry's age. “We made a schedule that had as few five-day weeks as possible. We tried to husband his energy in every way we could. but sometimes, we couldn't... In the walking scenes, with the repeating of the sequences, Harry walked about three miles in 100 degree heat. And that was just on screen. Have you seen Lucky? If you have, what did you think of this film? Let me know in the comments section below or over on Twitter. You can find me @500DaysOfFilm.